This word is Hakuna Matata,which is Kiswahili. Hakuna means no.Matata means problems. 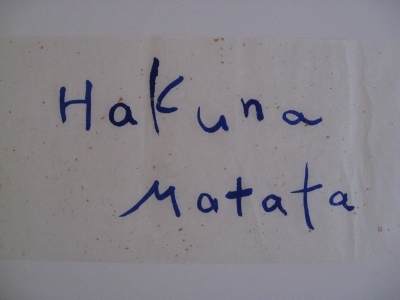 So, Hakuna Matata means "No worries". This is sung in the Walt Disney's animated movie "Lion King". This is Ms. Minori Usui's one of the favorite words. She is in her 20's.